Pelikan has released many special editions over the years, usually at the request of its customers. Sometimes these are brought about by the company and other times, they are special order pieces for companies that contract for a limited run. Many special editions are depicted in The Aviary which includes pens such as the M150 Bols, the M200 Deutsche Telekom, the M200 Citroenpers, and the M250 Tortoiseshell Brown. There is a much lesser known model out there that qualifies as a special edition and it is known as the M201. The M201 was released in the year 2000 and was a run of roughly 3000 pieces. This was a clear demonstrator with a black piston assembly/mechanism which has the same design/dimensions as the M200. Since it is a post-’97 model, it is distinguished by a crown cap top, single cap band, and has a single trim ring at the piston knob. The nib is gold-plated stainless steel. It is an M200 for all intents and purposes but was manufactured for the Japanese market and branded M201. I am not familiar with any other pen being branded as an M201. 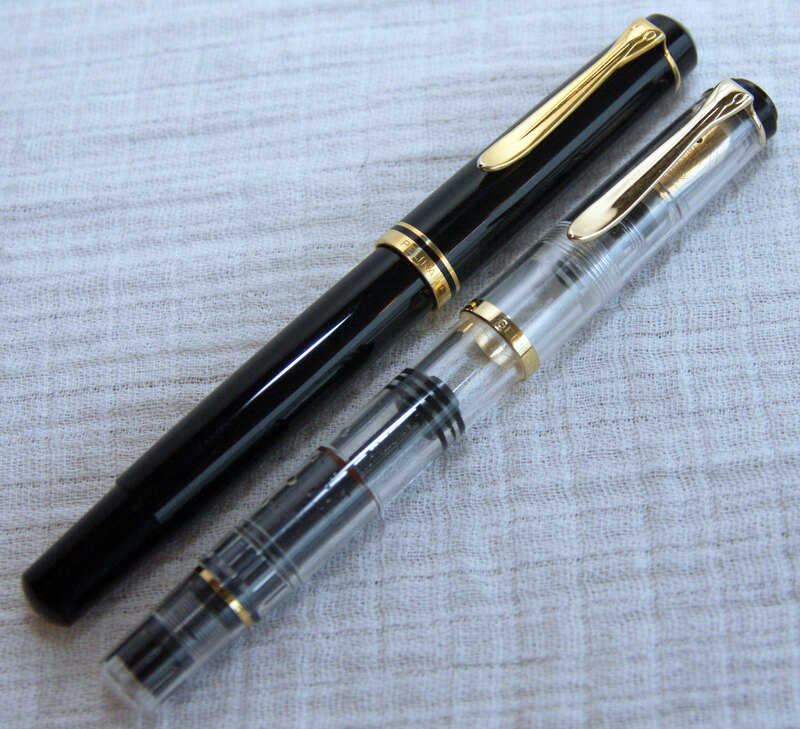 A clear demonstrator in the M250 line was also produced which is identical to the M201 with the exception of having a 14C – 585 gold nib instead of the stainless steel. This was made at the request of the Levenger company (the same company that sold the M250 Tortoiseshell Brown). If anyone can provide definitive documentation or evidence to support the existence of other pens branded as 201, I would be very interested in seeing that. If the information is verifiable, I will happily addend this post accordingly. Hi Joshua … thanks for posting! Something I had noticed with these particular demonstrator pens was the orange-red ring at the end of the piston housing. When I first saw it, I had thought that it was ink on the wrong side of the piston head (due to a leaky piston) but then I kept seeing the same thing repeatedly so obviously it’s part of the design. What do you think it is, really — some kind of sealant? or …? I’m not sure what the purpose of that ring is but it is definitely there by design. All of the older clear demonstrator models that I have seen have it. That would included the M201, M205, and M250. Interestingly the new clear demonstrator from 2012 does not have it. I personally favor the blue marbled over the green one. I hope that you weren’t too disappointed with the mix up.